In establishing this program, we were concerned that some monk students will be cared for while others are ignored. In order that all monk students will receive equal benefits and opportunities through the program, all money received would be used for the general welfare of the entire student body instead of an individual monk. 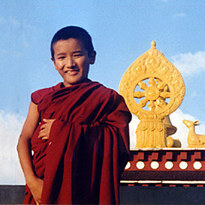 The cost of sponsoring a monk is US $20 per month. The monk chosen by an individual sponsor would be the monastery's representative to that sponsor. A sponsor can send personal correspondence and small annual gift to his or her ward. Your regular support will be of great help in preserving a highly endangered culture. A sponsorship packet will be sent to you with a photo and information concerning your sponsored monk. Even if you are unable to be a regular sponsor at this time but wish to help, we greatly welcome all contributions toward the general fund at any time. All donations are tax deductible. Before the Fund was established in 1988, the monastery provided only tea for breakfast, bread and tea for lunch, and a simple noodle soup or else rice and lentils for dinner. Anything other than this, the individual monks would have to provide for themselves. As most of them were refugees from Tibet with no means of support other than what the monastery could give them, they had to survive on this meager ration. Now the Fund has been able to improve the diet to the extent that all monks now receive daily tea and bread for breakfast; tea, bread and a vegetable dish for lunch; and a solid dinner in the evening. In addition, younger monks are provided with an egg each and also fresh fruit three times a week. This has greatly increased the health and well being of the entire student body. Ten years ago tuberculosis, a disease rarely contracted in Tibet due to its high altitude, was the major cause of deaths at the monastery in India. Along with the improved diets and by moving the medical clinic out of a small room under the temple into a more isolated building, they are able to better monitor and treat TB cases. Now it is no longer a life-threatening disease. Also the monastery is now able to cover 50% of all short-term medical expenses incurred by the young monks; the remaining 50% is covered by the monk's teachers and friends. The monastery covers 100% of the medical expenses of those monks requiring long term medical treatment. Another great accomplishment is the completion of a school for young monks to receive an education in modern subjects simultaneous to the traditional training. The school is recognized by the Indian educational board, and thus monks graduating from it will be eligible to attend Indian colleges and universities.